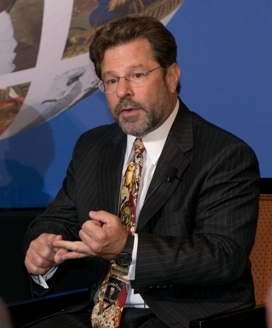 Clifford D. May is the founder and President of the Foundation for Defense of Democracies, created immediately following the 9/11 attacks on the United States. Under his leadership, FDD has become one of the nation's most highly regarded policy institutes and a sought-after voice on a wide range of national security issues. He has helped FDD to assemble a staff and advisory board of the most compelling scholars and experts whose ideas and research have helped shape important policies and legislation on terrorism, Islamism and democratization. Mr. May has had a long and distinguished career in international relations, journalism, communications and politics. A veteran news reporter, foreign correspondent and editor (at The New York Times and other publications), he has covered stories in more than two dozen countries, including Iran, Iraq, Afghanistan, Pakistan, Israel, the West Bank, Jordan, Turkey, Sudan, Ethiopia, China, Uzbekistan, Northern Ireland and Russia. A former syndicated columnist for Scripps Howard News Services, he is now the weekly "Foreign Desk" columnist of The Washington Times. He is a frequent guest on national and international television and radio news programs, providing analysis and participating in debates on national security issues. His writing has appeared in National Review, The Wall Street Journal, Commentary, USA Today, The Atlantic and many other publications. He is the co-editor of a book on the conflict in Afghanistan and Pakistan, as well as a book on energy policy. In 2006 he was appointed an advisor to the Iraq Study Group (Baker-Hamilton Commission) of the United States Institute of Peace, an independent nonpartisan national institution established and funded by Congress. He also received a two-year appointment to the bipartisan Advisory Committee on Democracy Promotion, reporting to Secretary of State Condoleezza Rice. In 2008, he was nominated by President George W. Bush to serve on the Broadcasting Board of Governors, the entity responsible for all US government and government sponsored, non-military, international broadcasting. In 2009, the U.S. Department of State awarded him a "U.S. Speaker and Specialist Grant" for a series of speaking engagements and meetings (with government and religious leaders, academics and journalists) in Pakistan. From 1997 to 2001, he served as the Director of Communications for the Republican National Committee. In that role, he was the Republican Party's staff spokesman, appearing frequently on national television and radio programs. In addition, he managed all RNC communications activities, including long-range strategic planning; press, radio and television services; online services; TV and radio coaching; speech writing; advertising and marketing; and he was editor of the official Republican magazine, Rising Tide. Mr. May holds master's degrees from both Columbia University's School of International Affairs and its School of Journalism. His undergraduate degree is from Sarah Lawrence College, and he holds a certificate in Russian language and literature from Leningrad State University, USSR. He is a member of the Washington Institute of Foreign Affairs.